Free Shipping Included! HTC VIVE Tracker Straps by DACCKIT - Precision full-body tracking for VR and Motion Capture, Straps Set for HTC VIVE Virtual Reality System Tracker 2018 (Including 1x Waist Belt, 2x Straps) by DACCKIT at Kode Fu Guru. Hurry! Limited time offer. Offer valid only while supplies last. 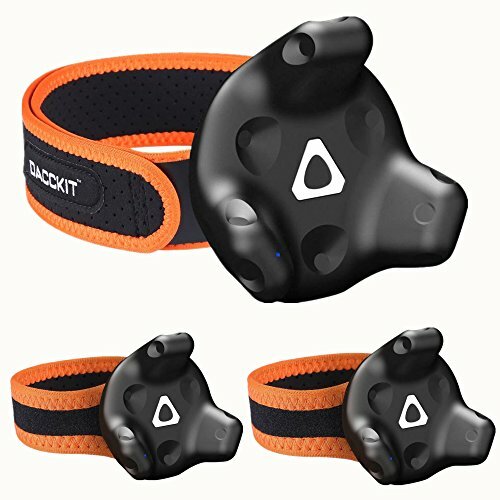 Why choose DACCKIT Straps Set for HTC VIVE Virtual Reality System Tracker 2018 ? Attach the VIVE Tracker to anything, works with the feet or waist . Why choose DACCKIT Straps Set for HTC VIVE Virtual Reality System Tracker 2018 ? Attach the VIVE Tracker to anything, works with the feet or waist . Experience true full-body tracking in VR ! Attach the VIVE Tracker to anything, works with the feet and waist. Elastic and anti-skid band help to adust the comfort degree, you won't feel tight when using it. Comfortable fit on nearly all waist sizes, from small children to Adult sizes. The VIVE Tracker Straps Set are Made of High Qualify Material, So you will Enjoy it for years. Construction durable enough for rugged gameplay and long VR sessions. Everything is designed for optimal use with your HTC VIVE Tracker. Left-Hand Path and much more. ▶ Worry-Free 12-Month Warranty and 100% Money Back Guarantee. ▶ Note: HTC VIVE Tracker Straps Set ONLY, HTC VIVE Virtual Reality System Tracker NOT INCLUDED. DURABLE & STRONG: Attach the HTC VIVE Tracker to anything, works best with the feet or shoes. (VIVE Tracker sold separately). Ultra high-quality construction durable enough for rugged gameplay and long VR sessions. COMFORTABLE: The Vive Tracker Straps Set is made from breathable elastic neoprene that's comfortable yet grips on any surface and shock-resistant silicone padding to absorb impact vibration. Elastic band help to adjust the comfort degree, you won't feel tight when using it. WHAT YOU GET: 1x High Performance HTC VIVE Tracker Straps Set by DACCKIT. Worry-Free 12-Month Warranty and 100% Money Back Guarantee. If you have any questions about this product by DACCKIT, contact us by completing and submitting the form below. If you are looking for a specif part number, please include it with your message.